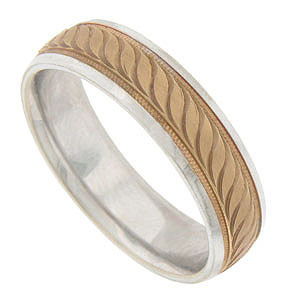 A repeating pattern of engraved curving leaves flanked by impressed milgrain adorns the face of this bi-color mens wedding band. The central pattern is crafted of 14K rose gold and framed by bright polished white gold edges. The antique style mens wedding ring measures 6.02 mm in width. Size 10. We cannot re-size, but we can reorder in other sizes. Also available in 18K, yellow gold, platinum, palladium or any combination of metals.